This week I received the latest photos from the Calpe Towers workbench. 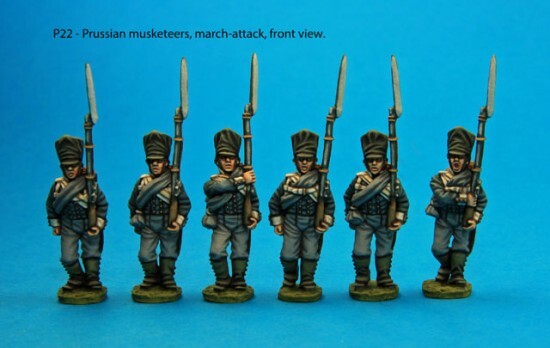 There are no surprises, because these figures are in line with what I’ve been trailing for a while – the first of the march-attack pose French infantry packs and a couple of packs of legere command and officer figures that you can use with the existing route march packs to create light infantry battalions. Without further ado, on to the pictures. Enjoy! F19: French light infantry command. F20: French light infantry foot officers. F22: French march-attack infantry, uncovered shakos. F25: French march-attack infantry, covered shakos. I know I’ve been quiet on the posting front the last couple of weeks – a case of reality intruding on enjoyment, I’m afraid. However, I expect to get back to more frequent posting in the next week or so and I have several updates lined up for you.